What has emerged is a fascinating, enjoyable and rewarding journey of co-evolution of learning and co-production of an improved design. The multi-skilled design team (MDT) we pulled together included general practitioners, receptionists and practice managers and my job was to show them how to use the health care systems engineering (HCSE) framework to diagnose, design, decide and deliver what they wanted: A safe, calm, efficient, high quality, value-4-money appointment booking service for their combined list of 50,000 patients. This week they reached the start of the ‘decide and deliver‘ phase. We have established the diagnosis of why the current booking system is not delivering what we all want (i.e. patients and practices), and we have assembled and verified the essential elements of an improved design. And the most important outcome for me is that the Primary Care MDT now feel confident and capable to decide what and how to deliver it themselves. That is what I call embedded capability and achieving it is always an emotional roller coaster ride that we call The Nerve Curve. What we are dealing with here is called a complex adaptive system (CAS) which has two main components: Processes and People. Both are complicated and behave in complex ways. Both will adapt and co-evolve over time. The processes are the result of the policies that the people produce. The policies are the result of the experiences that the people have and the explanations that they create to make intuitive sense of them. But, complex systems often behave in counter-intuitive ways, so our intuition can actually lead us to make unwise decisions that unintentionally perpetuate the problem we are trying to solve. The name given to this is a wicked problem. A health care systems engineer needs to be able to demonstrate where these hidden intuitive traps lurk, and to explain what causes them and how to avoid them. That is the reason the diagnosis and design phase is always a bit of a bumpy ride – emotionally – our Inner Chimp does not like to be challenged! We all resist change. Fear of the unknown is hard-wired into us by millions of years of evolution. But we know when we are making progress because the “ah ha” moments signal a slight shift of perception and a sudden new clarity of insight. The cognitive fog clears a bit and a some more of the unfamiliar terrain ahead comes into view. We are learning. The Primary Care MDT have experienced many of these penny-drop moments over the last six months and unfortunately there is not space here to describe them all, but I can share one pivotal example. A common symptom of a poorly designed process is a chronically chaotic queue. [NB. In medicine the term chronic means “long standing”. The opposite term is acute which means “recent onset”]. Many assume, intuitively, that the cause of a chronically chaotic queue is lack of capacity; hence the incessant calls for ‘more capacity’. And it appears that we have learned this reflex response by observing the effect of adding capacity – which is that the queue and chaos abate (for a while). So that proves that lack of capacity was the cause. Yes? Well actually it doesn’t. Proving causality requires a bit more work. And to illustrate this “temporal association does not prove causality trap” I invite you to consider this scenario. I have a headache => I take a paracetamol => my headache goes away => so the cause of my headache was lack of paracetamol. Yes? There are many contributory causes of chronically chaotic queues and lack of capacity is not one of them because the queue is chronic. What actually happens is that something else triggers the onset of chaos which then consumes the very resource we require to avoid the chaos. And once we slip into this trap we cannot escape! The chaos-perpretuating behaviour we observe is called fire-fighting and the necessary resource it consumes is called resilience. Six months ago, the Primary Care MDT believed that the cause of their chronic appointment booking chaos was a mismatch between demand and capacity – i.e. too much patient demand for the appointment capacity available. So, there was a very reasonable resistance to the idea of making the appointment booking process easier for patients – they justifiably feared being overwhelmed by a tsunami of unmet need! Six months on, the Primary Care MDT understand what actually causes chronic queues and that awareness has been achieved by a step-by-step process of explanation and experimentation in the relative safety of the weekly design sessions. We played simulation games – lots of them. One particularly memorable “Ah Ha!” moment happened when we played the Carveout Game which is done using dice, tiddly-winks, paper and coloured-pens. No computers. No statistics. No queue theory gobbledygook. No smoke-and-mirrors. No magic. What the Carveout Game demonstrates, practically and visually, is that an easy way to trigger the transition from calm-efficiency to chaotic-ineffectiveness is … to impose a carveout policy on a system that has been designed to achieve optimum efficiency by using averages. Boom! We slip on the twin banana skins of the Flaw-of-Averages and Sub-Optimisation, slide off the performance cliff, and career down the rocky slope of Chronic Chaos into the Depths of Despair – from which we cannot then escape. This visual demonstration was a cognitive turning point for the MDT. They now believed that there is a rational science to improvement and from there we were on the step-by-step climb to building the necessary embedded capability. It now felt like the team were pulling what they needed to know. I was no longer pushing. We had flipped from push-to-pull. That is called the tipping point. And that is how health care systems engineering (HCSE) works. Health care is a complex adaptive system, and what a health care systems engineer actually “designs” is a context-sensitive incubator that nurtures the seeds of innovation that already exist in the system and encourages them to germinate, grow and become strong enough to establish themselves. That is called “embedded improvement-by-design capability“. And each incubator need to be different – because each system is different. One-solution-fits-all-problems does not work here just as it does not in medicine. Each patient is both similar and unique. Just as in medicine, first we need to diagnose the actual cause; second we need to design some effective solutions; third we need to decide which design to implement and fourth we need to deliver it. But the how-to-do-it feels a bit counter-intuitive, and if it were not we would already be doing it. 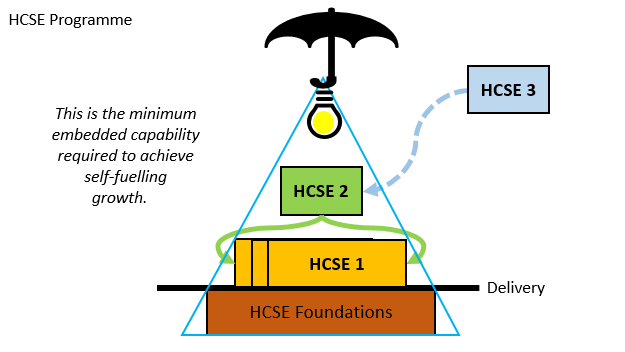 But the good news is that anyone can learn how to do HCSE.